Arutz Sheva's Hezki Ezra takes special test ride on Jerusalem Light Rail with Mayor Barkat and Minister Katz, who say it will strengthen Jerusalem. 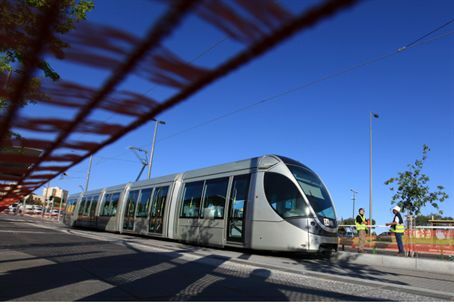 The up-and-coming Jerusalem Light Rail staged a two-mile test ride Monday morning. On board the train were Transportation Minister Yisrael Katz, CEO Yair Naveh of CityPass (the operator of the Light Rail project), and Jerusalem Mayor Nir Barkat. Arutz Sheva reporter Hezki Ezra joined them for the ride. Minister Katz said, "Residents of Jerusalem have suffered for many years [n terms of transportations], but now there is a light at the end of the tunnel." He said the train is part of the strengthening of the city. Mayor Barkat told Arutz Sheva's Hezki Ezra during the test drive, "You get used to good things fast; Jerusalemites suffered for an unnecessarily long time, but the train will give a boost to the quality of life in the city and help develop Jerusalem." Nadav Meroz, acting director of the light rail project, said, "Many residents of Jerusalem did not believe that this day would come, but the light rail will set off soon. The train will reach the city center," he said, noting that four billion shekels were invested in the project.